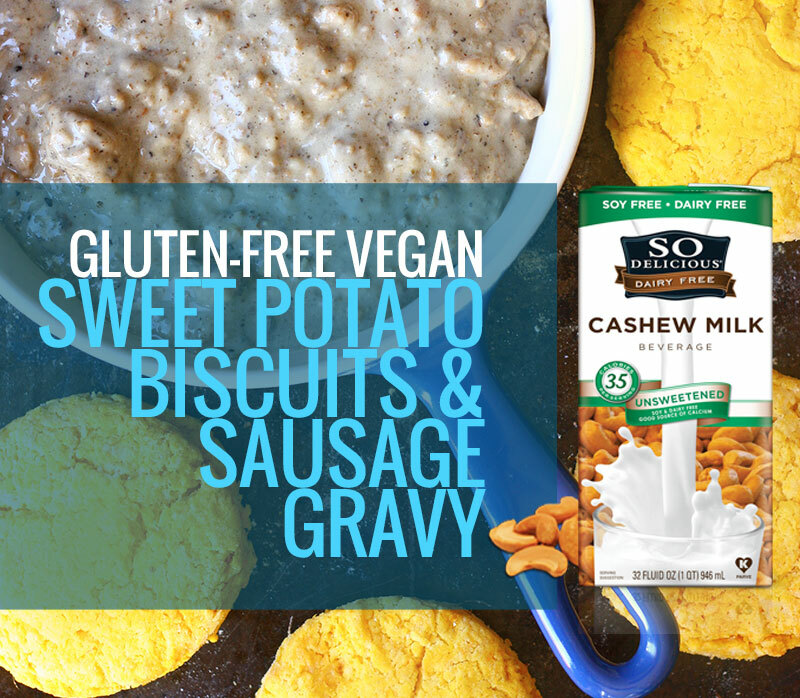 These gluten free vegan biscuits and gravy are dairy-free comfort food at its best! Sweet potato gives the biscuits a beautiful golden hue. 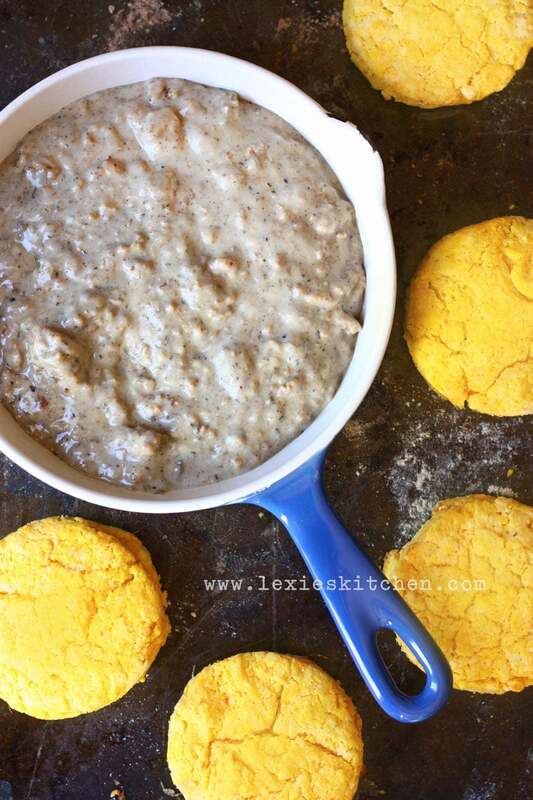 Gluten-free and vegan biscuits and gravy? Yep. Completely do-able! This morning my husband rolled out of bed at 2:30. He’s flying out to LA then hopping a ferry to Catalina Island where he’s chosen to run a 50-mile race. After feats like this he craves meat. Seriously craves it. The bigger the roast, the better. The utter and instantaneous satisfaction that spreads across his face at first bite is a sight to behold. Since he’ll be far from home, that whole “meat fix” thing is probably going to be had at some lovely Avalon Bay white linen table cloth kinda joint complete with ocean view. Well anyway, contrary to how my husband enjoys meat, I could go without it. So when my “scouting” meat-lover is gone, I go meatless. Sure, there are a couple of times a year I full-on crave meat, but the rest of the time I can do without it. 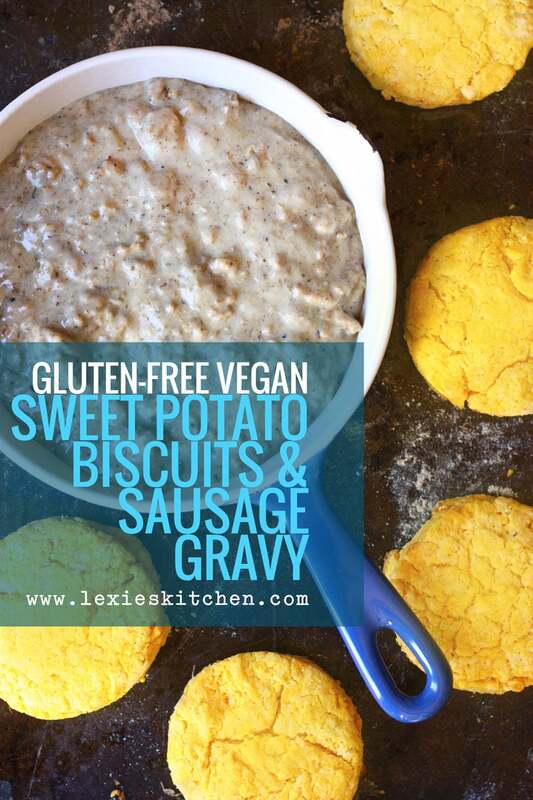 So with the house to myself and snow coming down, I think I’ll head to the kitchen and whip up my favorite Gluten Free Vegan Sweet Potato Biscuits and Sausage Gravy. Will you join me? It’s dairy-free comfort food at its best! I love the peppery heat of this meatless sausage gravy. The Beyond Meat® Beef Crumbles are optional (though I love these because they are pea protein-based versus soy). You could just mix the Spicely seasoning into the gravy for a smooth spiced gravy. Alternatively, you could use your favorite breakfast sausage in place of the beef crumbles and sausage seasoning. Preheat oven to 450F. Line baking sheet with parchment. In a medium bowl stir cashew milk and vinegar. Let stand 2-3 minutes. Add mashed sweet potato to milk mixture and stir to combine. Set aside. In a large mixing bowl combine the dry ingredients; flours, psyllium husk, baking powder and salt. Drop chilled shortening into the flour mixture one tablespoon at a time. Using your fingertips, rub shortening into the flour mixture until you have achieved pea-sized pieces. Add wet ingredients to dry and stir just until combined. Gently kneading as you go, gather dough into a ball. Turn out onto a flour-dusted surface. Gently press dough out to a one-inch thick disk. Cut out biscuits using a 2½-inch biscuit cutter. Gather scraps, gently press together and press out remaining biscuits. Arrange biscuits on baking sheet. Brush tops with melted margarine and sprinkle lightly with salt. Bake 12 minutes. Serve warm. Heat 1 teaspoon of oil in a medium skillet over medium heat. Add meat crumbles and sausage seasoning. Cook just until heated through. Remove meat crumbles from skillet and set aside. Add remaining 3 tablespoons oil and flour to skillet. Whisk over medium heat until smooth and mixture begins to bubble. Whisk in milk. Continue whisking 1-2 minutes until smooth and thickened. Adjust gravy to desired thickness by adding more milk. Stir in sausage mixture. Serve over warm biscuits. Refrain from over handling the dough. As my grandmother always said "a tender touch makes a tender biscuit" (okay, she never really said that but it sounds like something a grandmother would say). So Delicious Coconut Milk Beverage may be used in place of Cashew Milk. Psyllium husk adds tenderness to the biscuits, but is optional in this recipe. For this recipe, superfine rice flour and most all-purpose gluten-free flour mixes may be used in place of Bob's Red Mill All Purpose Gluten Free Flour. So Delicious Coconut Milk Beverage may be used in place of Cashew Milk. I picked up Spicely Breakfast Sausage at Whole Foods. They are sold in that display of little boxes—you'll know them when you see them. My local Kroger store carries the same display but was either out of the Breakfast Sausage Seasoning or didn't carry it. You can find it on Amazon. Want to make your own seasoning? I am sure this one from "The Man"—Alton Brown—would rock your meatless crumbles. I like that he uses fresh herbs. © 2016 Flo and Grace. Disclosure: This post was sponsored by So Delicious®. As always, all thoughts and opinions are my own. Here’s to living with flow and grace. FLO & GRACE™ is a wellness lifestyle magazine. Our mission is to inspire women to seek the good in life and to take charge of their health and happiness. We do this by delivering expert insights, dishing up nourishing recipes, advocating natural approaches to health and healing, stimulating creative juices with do-able DIYs, and promoting products, services and places that support midlife women and our mission. WOW! What a dish. I love that the biscuits are made with sweet potato – I’ve never tried this before. It all looks so nourishing and comforting. I can not wait to try this! I just bought some Bob Reds Mill Gluten Free Biscuit Mix. So I may try to alter a bit using it. Ha! I just bought a bunch of the same mix. On clearance at our Kroger. Woot! Hope you like. I have all the ingredients for this but the vegetable shortening- do you have any suggestions for a substitute? Could I try more vegan butter? Thanks so much! Thanks for the helpful answer! I Just made this for dinner and it was delicious! Woo hoo!! Thank you for reporting back. I haven’t made them for a while … now you’ve inspired me! @2018 Flo & Grace. All Rights Reserved.